New Shamu Night Show coming to All Seaworld Parks. Today Seaworld Parks announced that in Summer of 2014, they will be launching an all new "Nighttime Shamu Show" to replace the seven year old "Shamu Rocks" show. 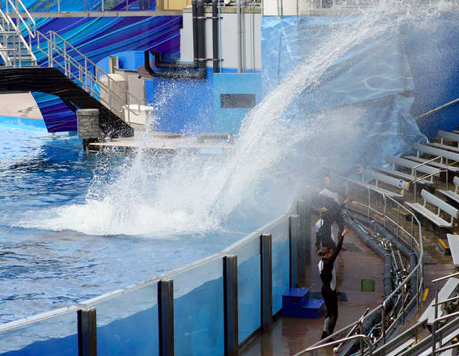 This new orca show works with Seaworlds big "Sea of Surprises" 50th anniversary projects. Along with the new shamu show, the parks will be adding in other fun surprises for visiting guests. Including expanded animal encounters and art installations (made from washed up ocean debris). Along with this, Seaworld San Diego is getting a new entrance plaza called "Explorers Reef" which will feature touch pools and learning stations. None of these moves have been a response to the sad phenomena of "Blackfish" (which isn't getting that Oscar they so wanted- HA!). The parks have reported record earnings and states these anniversary programs have been on the list since they decided to make a project of the event.